In March of 2015, one the very first blogs I ever began reading and one of my most favorite blogs still, Money Saving Mom, had a blog post about living in small homes. I left a comment about my family of four living in a 650 sq. foot home. I surprisingly received a few replies (including one from Crystal, the Money Saving Mom, herself :)) stating interest in reading a post about small home ideas if I were to write one. So here it is! Room by room, how our family makes do in our small home. I should note that 700 sq. ft. is only small to some. Those who live in large cities recognize that you can do a lot with 700 sq feet and I feel very lucky to have the home that I do. 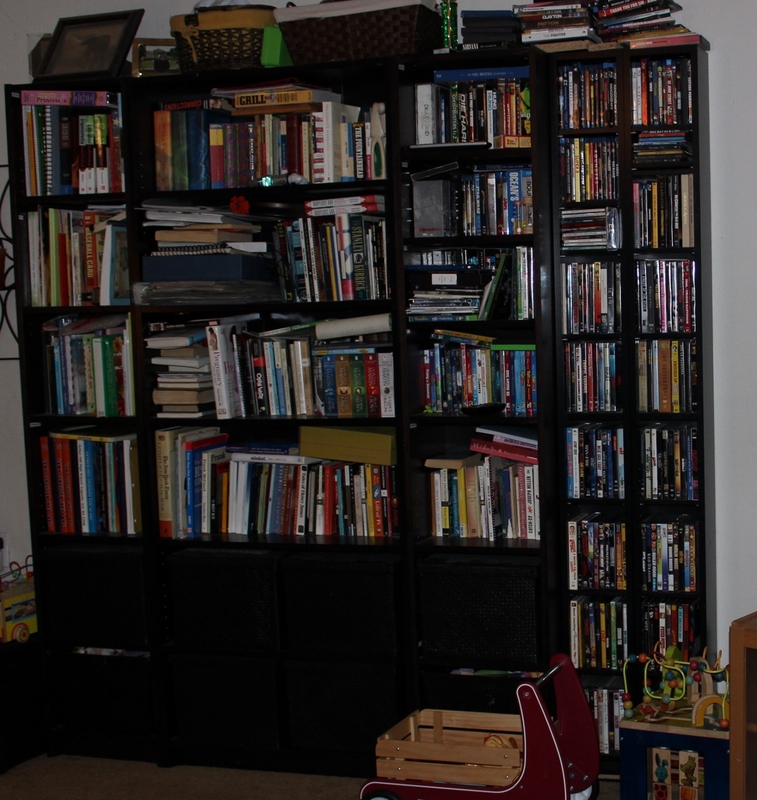 – Oh the classic and versatile Ikea EXPEDIT shelving system! This particular 2 x 4 cube shelf has been re-purposed in many different rooms and for many different uses over the years. Note: It looks like Ikea no longer sells the famous Expedit series! According to this article they’ve made some changes and renamed the series KALLAX, though the shelves look exactly the same to me. – I added coat hooks to both sides of the shelving unit to hold everyone’s sweaters, as well as a coat rack to the wall for scarves, hats, bags etc. – This is the shoe rack we have: Room Essentials™ 15-Unit Organizer – Espresso. 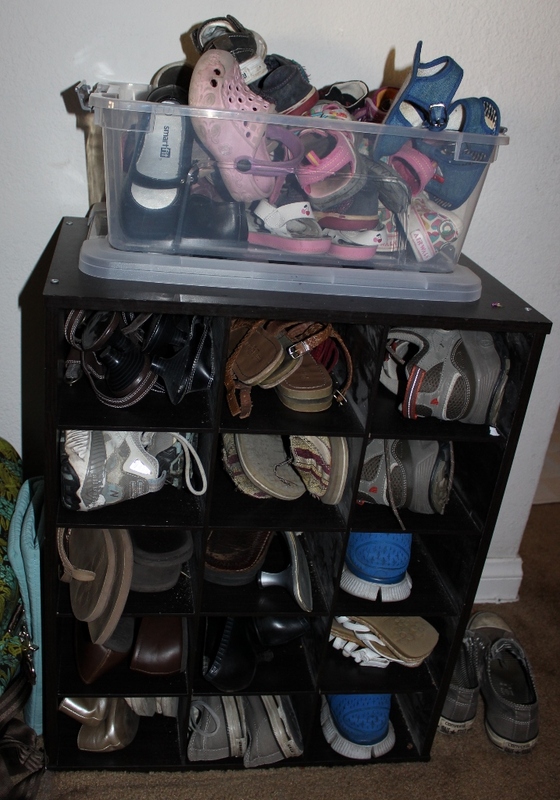 My 3.5 yr old calls it a “shoe garage”; I don’t know if she learned that at school, but it’s kind of cute. We use a plastic tub on top for kid shoes since those seem to quickly take over and are too small to keep neatly in the “shoe garage”. Don’t forget to check out the much much nicer UPDATED pics of my Front Entryway Area! – This work/craft wall is the very first thing anyone sees when they walk into our house. I’d love to stay that I keep it beautifully organized and presentable, but I don’t. If anything, as the initial focal point it is correctly representative of the rest of our home: lived in and loved. – The wall shelves are EKBY JARPEN/EKBY BJARNUM from Ikea. – Almost all of the organizational boxes and bins are various series of Ikea products. – I pulled together the standing desk on my own using four AVDALA bookcases and two flat countertops I found in the discounted As-Is section. They may have been LILLTRAS, but I’m not positive. A standing height desk is perfect for working with kids in a small open-living space. I’m able to sit and focus if I have awhile, stand if I only have a few minutes, and I can easily check for new emails as I walk by. 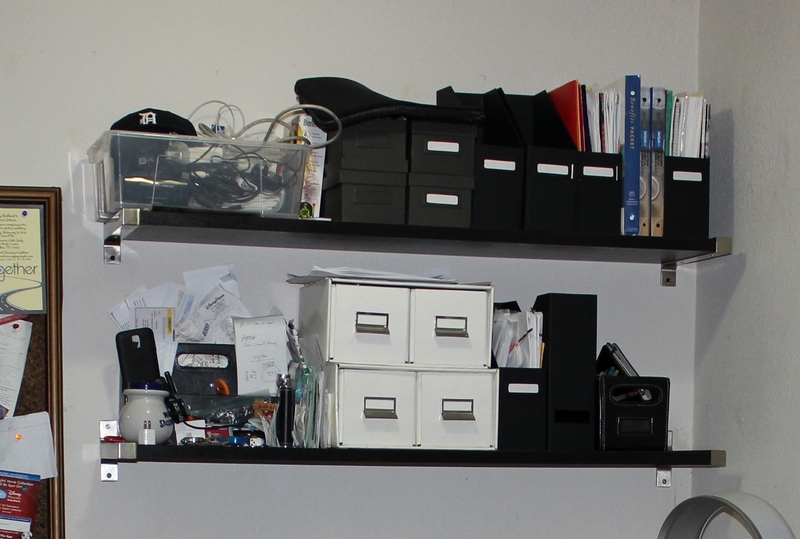 – Underneath the desk I have a hidden storage area and some shelves. It’s a mess in here, but it does house the laser printer and some other office supplies. C likes to play hide and seek behind the curtain. – The shelves on the left of the desk are C’s “Big Girl Shelf” with toys and activities that are mainly for her and that she only gets to play when S is sleeping or otherwise occupied. Yes, Baby Almost-Toddler(snif, snif) S does get into the shelf sometimes but nothing in there is breakable and we try to steer him away and we just clean it up he does get into it. – The shelves on the right hold some craft stuff and other things. Yes, both my kids sometimes get into these, but it’s mostly ribbon and yarn and sometimes I let them play with it and we then clean up the mess together afterward. 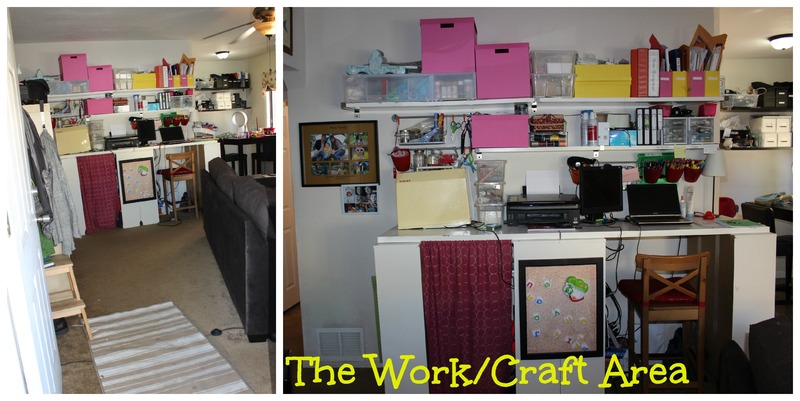 Don’t forget to check out the much nicer UPDATED pics of my Work/ Craft Space! – We used to have a coffee table, but we got rid of it. Our living room is now more open for a soon-to-be-walking baby and a preschooler to play in. The living room is the main hub of activity and the largest area of the house. We do have this pretty cool side table that we can push up to the middle of the couch if we’d like a place to set drinks/food on. – The bookcases are from, no surprise here, Ikea. The BILLY series. The boxes on the bottom two rows contain craft and office supplies, as well as random small toys that we can hide away quickly to pick up the living room. 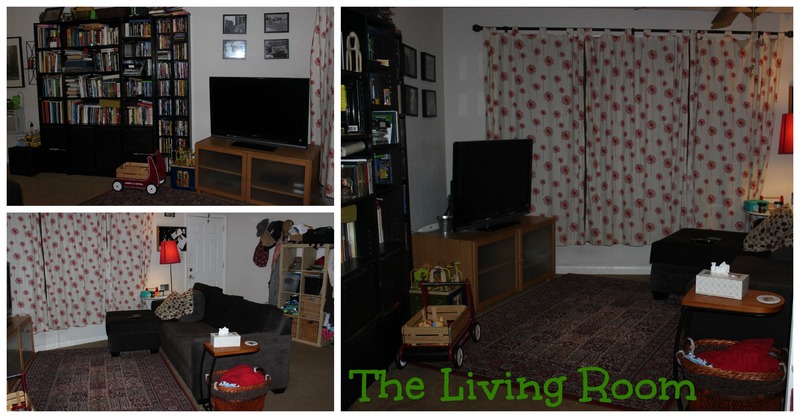 Don’t forget to check out the much nicer UPDATED pics of my Living Room Area! Overall the front entryway/workspace/living room combined area is 16′ x 15′ = 240 sq. ft.
– The table is bar height. Ikea BJURSTA. Because typical high chairs don’t fit with bar height tables, we instead opted for the Fisher-Price Booster High Chair Seat that we could use with a bar stool chair. It’s been a perfect solution. – Due to KP’s erratic work schedule, we unfortunately don’t have many regular family dinners together, but for those times when we do need 4 chairs, we pull the chair over from my work desk. – The dining room table doubles as KP’s work-from-home space. There are more EKBY JARPEN/EKBY BJARNUM wall shelves for his stuff here. – This is also our family command center with a wall calendar and bulletin board. – You may notice our Expansion Gate “accordion-style” baby gate installed along the wall. We used this a lot when C was a baby but haven’t used it much with S. It is a super helpful gate system for small homes though! I LOVE how it folds out of the way when not in use, yet is easy to pull out for when you want to contain baby to certain parts of the house. – The dining room area is 6.5′ x 7′ = 45.5 sq. 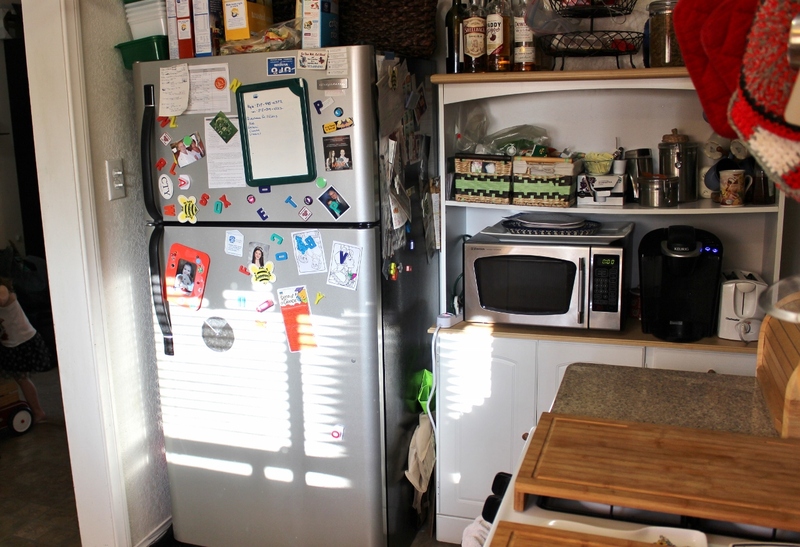 ft.
– We only have one outlet in the kitchen and it’s behind the refrigerator. This makes things a bit interesting as far as kitchen appliances, but we make it work. If we need to plug in a crockpot or blender, we typically put it on top of the washing machine. Or on the floor in the dining area. Whatever works! – After VERY careful measurements, I got this New Visions by Lane Kitchen Buffet and New Visions by Lane Hutch to fit in the space next to the fridge. This buffet/hutch combo has given us much needed kitchen space! 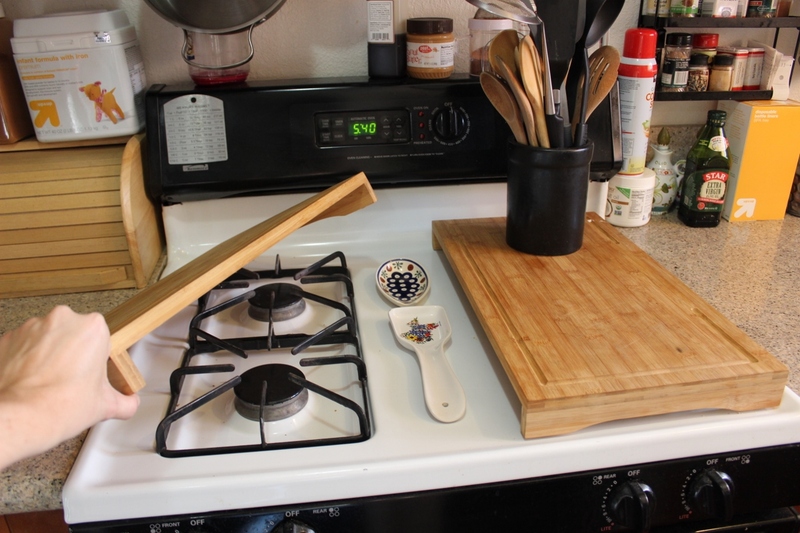 – Probably my most favorite space-saving item in the kitchen are these Bamboo Over the Sink/Stove Cutting Boards. They are the best things! I use them as cutting boards and as extra counter space and they just make the kitchen look nicer somehow. 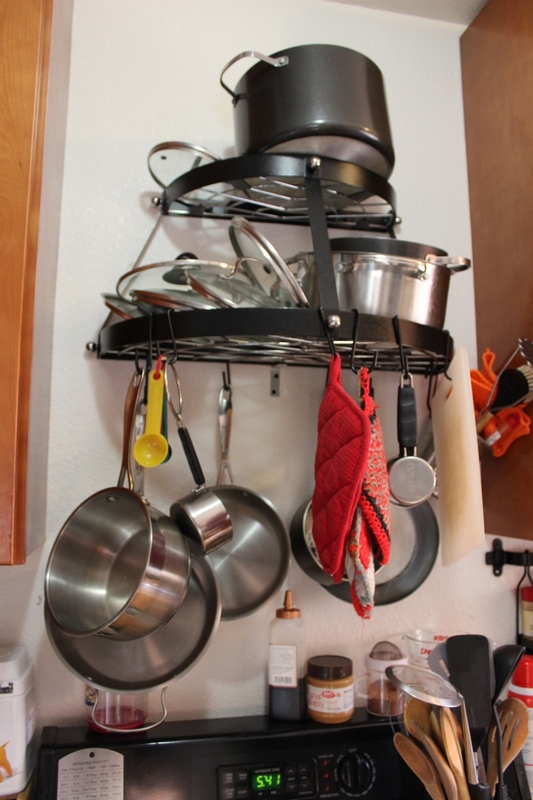 – My second favorite space-saving kitchen item is my Range Kleen 2 Wall Mount Pot Rack. Not only does it look nice and keep pots, lids, measuring cups, and potholders within easy reach, but it allowed us to free up a cupboard for something else. You may notice that our cabinet/cupboard space is a bit lacking. – The kitchen area is 6.5′ x 11′ = 71.5 sq. 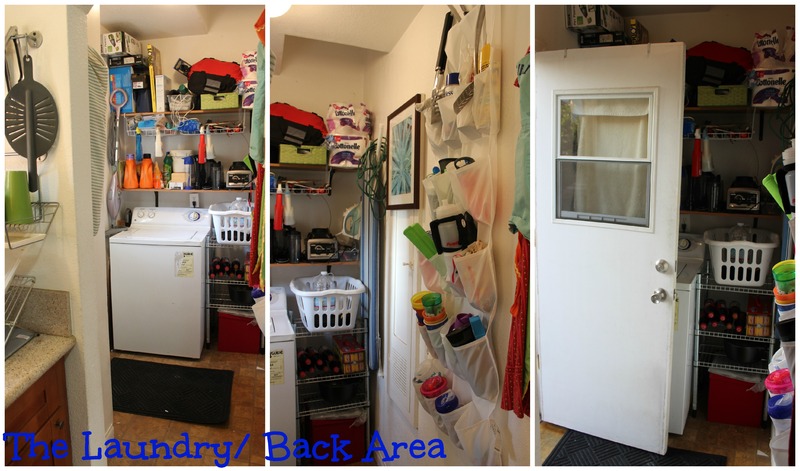 ft.
– When we moved into this house we brought with us a side-by-side washer dryer set. There was not room for both in this tiny space. I suppose we could have bought a stackable combo, but we never did. Currently our washer is inside and our dryer is out in the hot water shed on the side of the house. – We have a shoe hanger to collects odds and ends, sippy cups, bottles, bibs, grill stuff, etc. 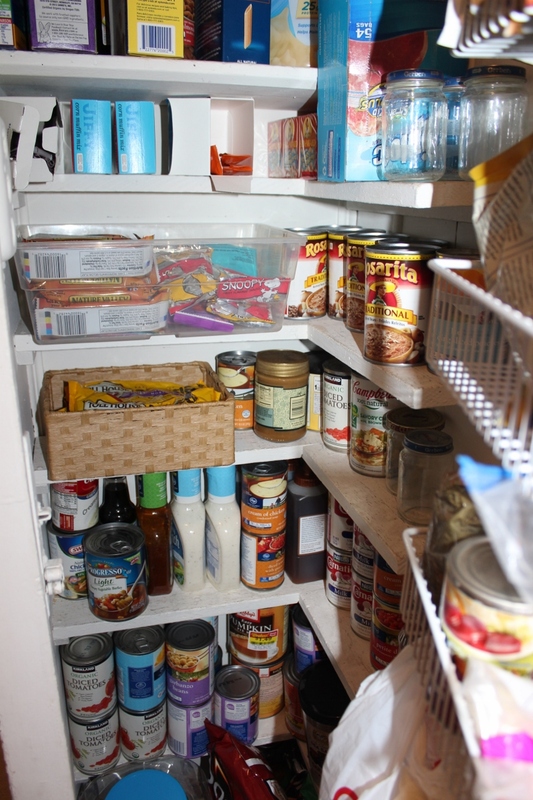 – Our tiny pantry luckily came with these very odd little shelves that are the perfect height for cans and other food items. I added some extra shelves to the door. It’s a tiny pantry, but we make it work. We also store food in the buffet/hutch. – The laundry room area is 7′ x 4.5′ = 31.5 sq. ft.
– That bathroom door allllmost scrapes the toilet when you close the door. The good news is that no little kids can barge open the door while your using the restroom, ha ha! Although you may get some banged up knees. 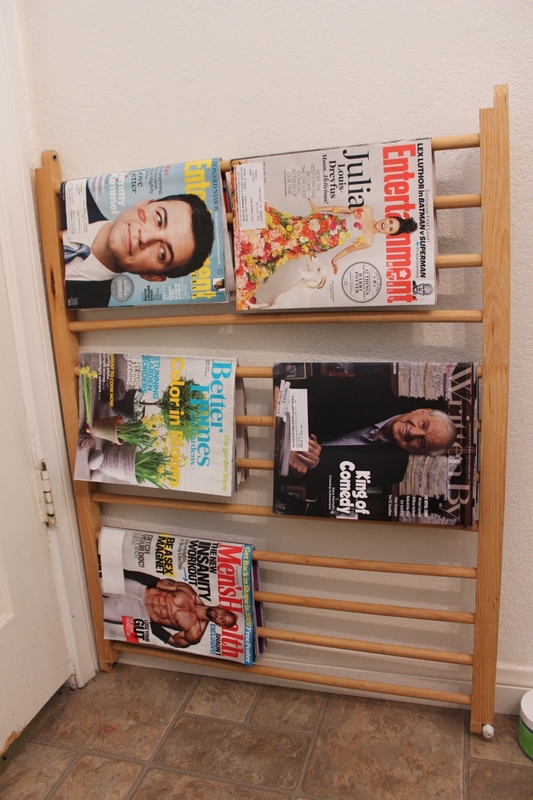 – We used an old crib railing behind the bathroom door as a magazine rack. This fits perfectly into a space that otherwise would have been completely useless. 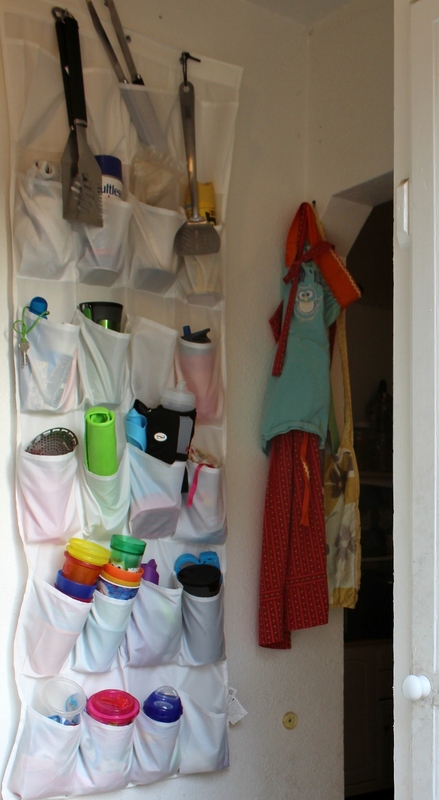 – I really like this NORDRANA hanging storage. It fits quite well into the little space between the mirror and medicine cabinet and looks nice. 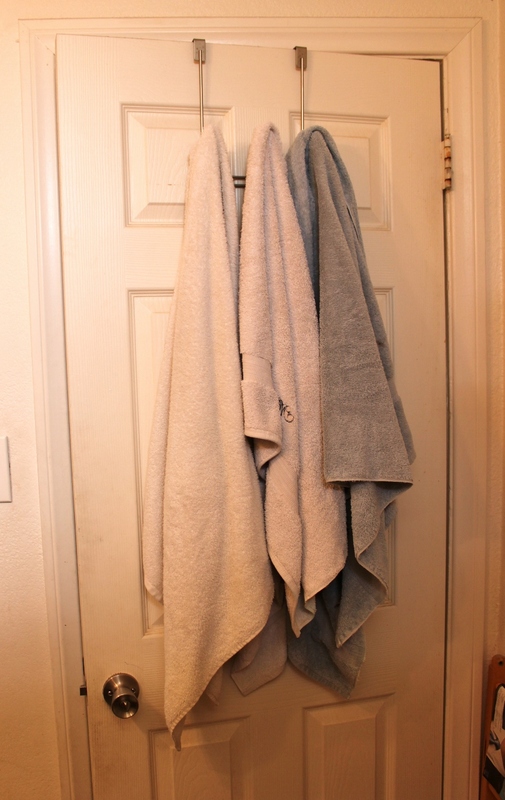 – We have an over the door hanger for towels. – The bathroom area is 5′ x 7.5′ = 37.5 sq. ft.
KIDS’ BEDROOM – 5/6/17: Eek! We’re having Baby #3 in the next couple weeks – see the UPDATED Kids Room HERE! – I originally was going to DIY some kind of railing system for the TROFAST shelving unit “stairs” leading up to C’s loft bed, but I never got around to it and C has never needed them. I also once had labels on all the toy bins but they’ve fallen off. Someday I’ll replace them. Oh well. 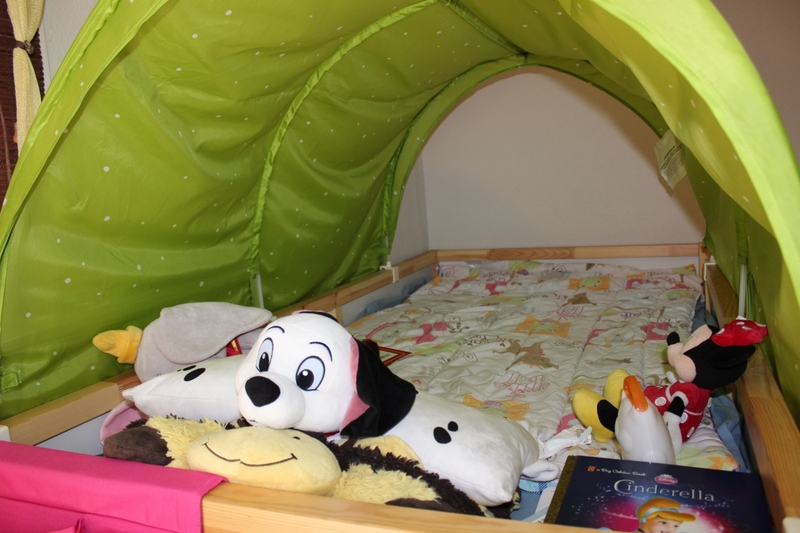 – Under the loft bed is C’s “clubhouse”, though S certainly hangs out in there too. I was able to barely fit C’s KidKraft Vintage Kitchen play set underneath by taking off the legs and fridge door. The kids don’t seem to mind. I also put up this rope lighting (Darice LT-TUBE-1 Tube Light Set with Bulb, 18-Feet, Clear) to give it some more light under the bed and to make it look fun. – Next to the bed are some more TROFAST shelves with more toys and C’s dress up stuff. – The crib (which later converts to a toddler bed), wardrobe and changing table are all part of the HENSVIK series. The changing table is actually a bookcase, but I purchased the changing table attachment part. Someday, if we don’t have anymore kids, I can take this off and use just the bookshelf part. 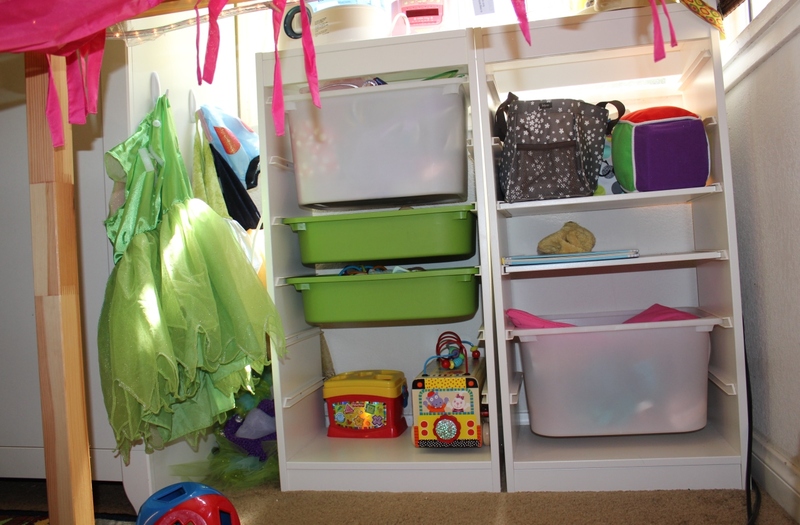 – Inside the wardrobe, I organize the kids clothes in bins. 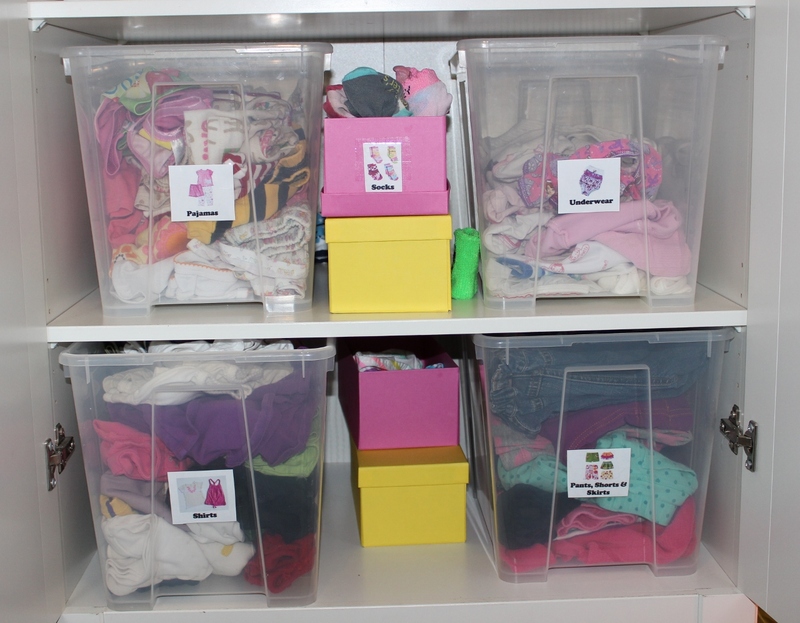 Since C is old enough to put away and pick our her own clothes, I’ve put word/picture labels on the bins for her. 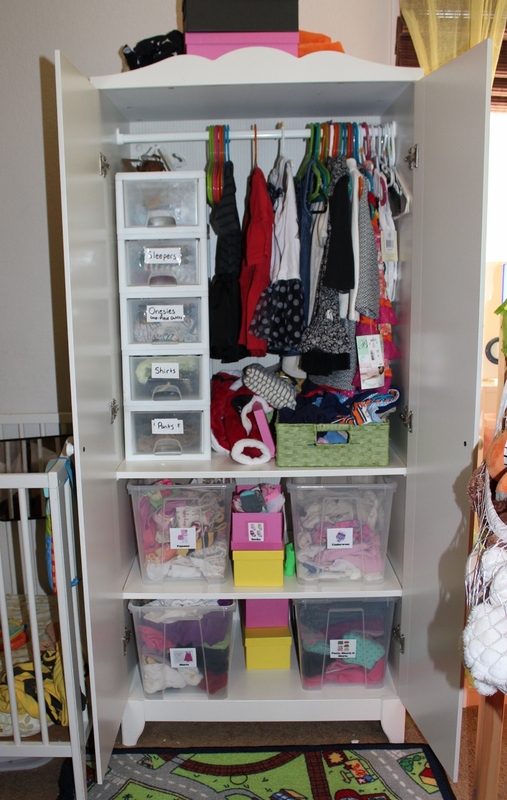 Storing clothes this way for a preschooler is way easier than in drawers! 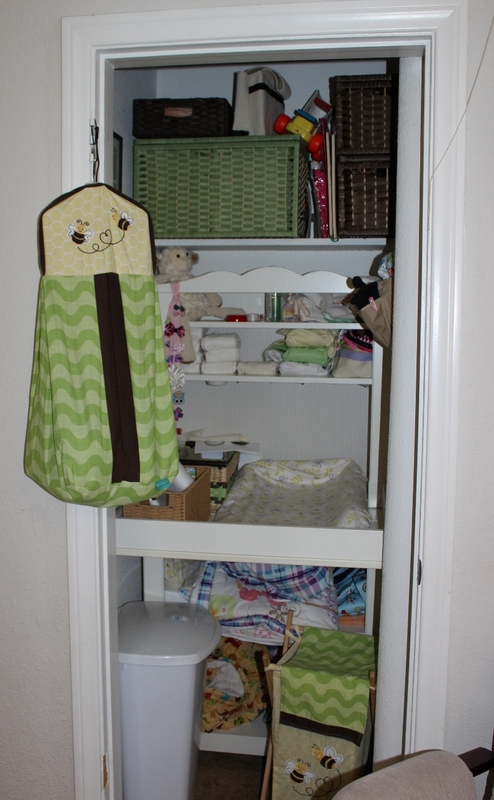 – To make more room, we took off the closet door and turned the closet into the changing table area. Luckily the changing table just barely fit! To be honest, while I used to change C on the changing table, I’ve hardly ever changed S on it and just use the floor instead. Still, it’s a nice place to store all the diaper stuff and other random things. 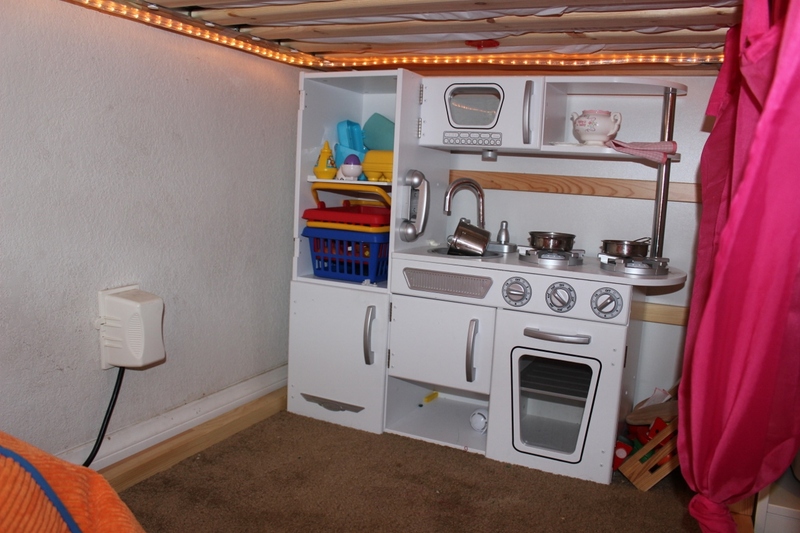 – The kids’ room area, other than the closet that I did not measure, is 11′ x 9′ = 99 sq. ft.
– Our bedroom is probably the least interesting room of all, so much so that I’m not even taking a picture if it! I know, I know, I should probably put more effort into making it feel more special. It’s the next room on my mental list to put some umph into. – A while back, we bought a matching bedroom set, NOT Ikea, you know, like “real” grownups. It all barely fits into our room, but it does. – In case any more babies come along while we still live here, they will probably stay in our room for as long as possible. We can fit a travel pack n play or mini co-sleeper at the foot of our bed with enough room to get around it to the other side. – Our bedroom area is 11′ x 12.5′ = 137.5 sq. ft.
Great post! I love the kids bedroom. When my daughter gets a little older, I’ll probably try something like that – she’d love it. I love the idea of using crib rails as a magazine rack. I’m going to buy the over the sink/stove cutting board now. Thanks for sharing your tips. You’re so welcome. 🙂 I hope you enjoy the over the stove cutting board – I really love mine! Thanks for putting together such a detailed post! It’s impressive how you have managed to make such efficient use of your space. I am visiting from MSM, and I want to thank you for taking the time to create such a wonderfully detailed post. I rent a small apartment so I cannot make any changes, but I got many great ideas that might help us with the lack of space and storage. Oh, we’re renting too! I know that some renters are not allowed to hang shelving, but we did. It may come out of a deposit eventually, but shelving was worth it enough for us to invest in. Plus, we’ve been living here long enough now that I think the landlord likes us, ha ha. If we ever move, we’ll probably give the landlord the option to leave them or have us take them. It is hard renting though, because there’s only so much you’re allowed to do. Thanks for your post. I live in LA in a small house with my kids so I totally understand! Fun to get new tips! Oh, that’s great that you’re in L.A. too. Square footage is so much harder to come by here than other places – I always get jealous watching HGTV on people in other places being able to buy 2,000 sq. ft. house for like $250,000! Oh well, we do have pretty awesome weather, so I guess it makes up for it. 🙂 Thanks for stopping by! Lol we live in a 1,600 sq ft double wide 3 bedroom, 2 bathroom with a 40x 50 barn and 2 acres and paid $40,000. Good ole beautiful Southern Illinois! It is anazing to see how everything varies GREATLY by area. I am completely shocked to see what people pay in big cities! For $200,000 here you would get a HUGE house! Awesome. Thanks for the tour! Currently we live in a 500-700 square foot (I should officially measure some day…) apartment and I love it and love seeing other ideas! Our place is hugly Ikea as well though my closest one is 2 hours away. 🙁 Thanks again! great post! I like seeing pictures of how you do it. My family of 5 lives in a 900 sq ft house so it definitely takes some creativity to do life in tight quarters. Thanks for sharing! The desk/bookshelves/secret hideaway is AWESOME!! Also really like the stairs/bookcase to the loft!! (PS The first pantry is spelled wrong 🙂 ) Wonderful post! Thank you for all the IKEA links! Oh, you’re so welcome! I’m glad you liked it and hope it gave you some ideas. Please do steal the idea! It’s worked out perfectly for my preschooler so she knows where to put her clothes and where to find things to get herself dressed. Oh, and she also starts to learn the words too. I love making them learn when they don’t realize their learning heh heh heh. I love how you arranged everything in such a small space! Where do you buy the rope lighting you have under the loft bed? Thanks – oh, and I just updated my post with a link to those lights. I figure that’s probably a good idea to link to that others might be interested in too. My house is 900 sq ft but we really only live in 600-700 sq ft of the house since the upstairs is to hot in the summer and to cold in the winter it is used for storage. My house consist of a living room, tiny kitchen which also includes my washer and dryer and only one counter (no room for a table), one bathroom (just like yours) and two small bedrooms and a hall closet and that is it! I use a cutiting board on top of my dryer due to limited space. I LOVE the boards on top of the stove!! I too hang my pots on a rack but never seen the dish rack, which would be great for me and free up a tiny piece of my one counter in the kitchen. Got a couple of ideas from your post and enjoyed it! Everyone I know lives in a large house and I have been embarrassed of my tiny house and never have people over. Nice to see others living like I do and real pictures and not “perfect homes” is refreshing! Thanks so much for leaving a comment and I’m so glad you got some ideas from it. The hanging dish rack is from Ikea. Luckily we do have a small backyard so when we do have people over, it’s always always a backyard get-together. Thanks for sharing. I wrote the post about smaller houses on Money Saving Mom that you originally commented on. 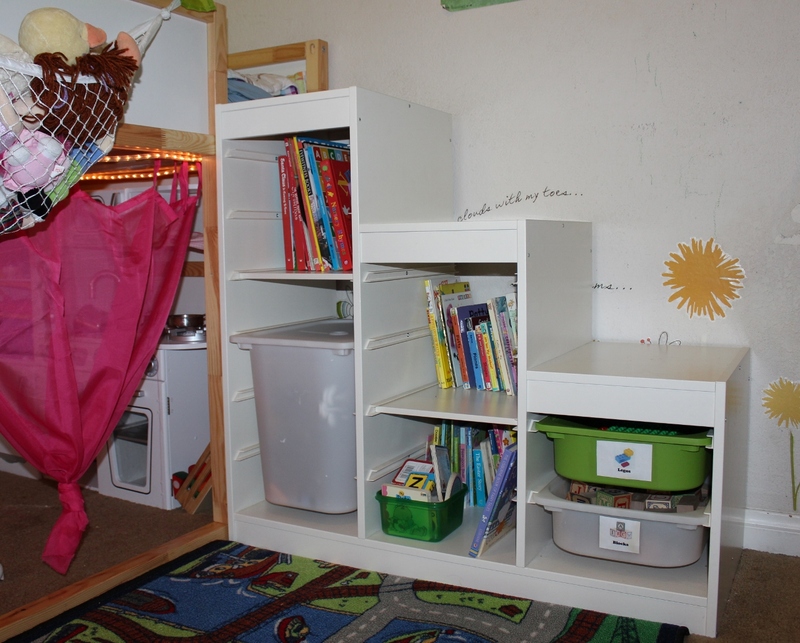 I love seeing how you have made your space work for your family, and I love your kids’ bedroom! This is incredible! I bookmarked this post. We are currently in an 1100 sq ft apartment that looks huge compared to your place. But, we are soon moving overseas and may be in an even smaller place. I love your ideas and especially the fact that a lot of it is from Ikea! Thanks Margo! Oh and how exciting about moving overseas! I really enjoyed reading this post, I really appreciate how ‘real’ your house looks and how you are using each space wisely. Very inspiring, thanks for sharing!!! What a great post! I live in a fairly small house (~1,000 sq. ft.) with my husband and 2 children as well. It’s easier to clean than a McMansion but it’s sure hard to find “extra” space for storage. 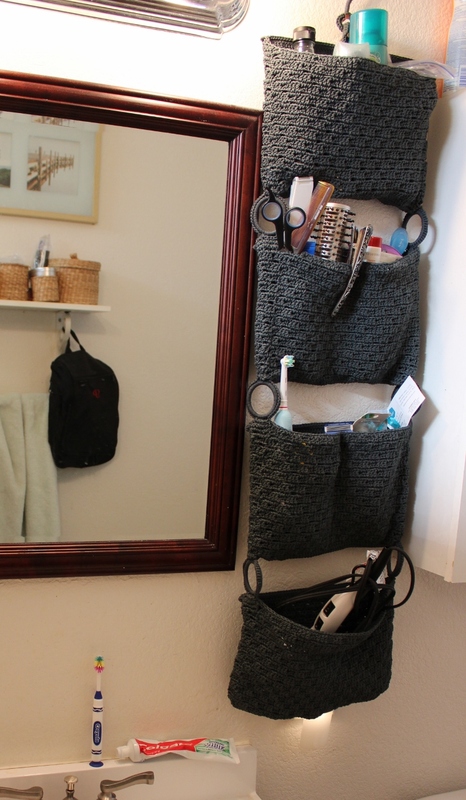 I love your idea in the bathroom with the old crib bars for a magazine holder…I need to do that! It would be so much better than the stack on the sink 🙂 Thanks for sharing your home! You’re so welcome – I’m glad you found it helpful! I love what you’ve been able to do in such a small space. I thought our house was tiny at only 873sq feet. It must be especially hard with little ones. I also love that your pictures are authentic! I don’t know anyone who has the “Better Homes and Garden” look. And when I see those kind of pictures I tend to roll my eyes and think Yeah, right! Thanks for a few ideas on space saving. Especially in the kitchen! Could not agree more, Nicole! Even ppl I know with huge houses don’t have that look!!! You know what I love about your house? You don’t have much room but you have a billion books. I think that’s really great. Everybody tells me my books are clutter but they are important and set a good example for our kids of the importance of reading and learning. Good for you! I loved seeing your warm, loving house. Thank you for sharing it. WOW—I’m SO impressed…and got a lot of great ideas here. Thank you so much! You’re SO welcome! 🙂 Thanks for visiting! Family of 5 in 900 sq. Ft and no closets! I totally could have written this post lol. You are using a lot of the same things I am in my home. Love my range kleen pot rack too! Please post more like this. As a wife of a startup business owner we have similar struggles. Thanks for the feedback! As soon as I can get it together, I’d next really like to do a post about finances & budgeting with extremely irregular incomes, because that’s kind of an interesting challenge for us too. What kind of business is your husband starting? Hi I recently reread this post. i loved it so much when I saw it on money saving mom. I also read your story of how you cam to Hollywood and following your dreams with the kids. We too recently moved to the west coast to follow a dream. We live in Seattle. We often talk about what it would be like if we had made this move 10 years ago before the kids. IT would have been a lot easier on us and the kids. Like you we have had our share of feast and famine and it has truly tested the strength of our 10 year marriage. I agree with you so much that you just need to never think about divorce as an option and things will work out. Good luck with everything. I will be rooting for you from our small west coast home! Aw, thanks for the comment Melissa and nice to meet you! I’ll be rooting for you too! These are some great ideas. I also have a family of 4 in a smaller space. Great tips! I love the ikea stuff. I was actually just looking into the KURA loft bed.. it seems like a real space saver. Yay! Love your blog, found my way here via moneysavingmom. We have a family of 6 living in 850 sq ft., so I can relate big time!! Love your ideas! I love how real this post is! It is difficult to feel content with your home with all the magazine ready blogs, Pinterest, tv shows… Thank you for sharing your home, it has helped me feel ok with not having a picture perfect home, but a loved and “lived in” home. I realize this post is old, but I just wanted to chime in and comment that my 6 & 8 year old share a bedroom and use an ikea KURA bed as a bunk bed. We just put a SULTAN slatted bed base (which is essentially 2x4s tacked on to some sort of thick plastic/polypropylene strip at regular intervals) inside of the bottom, and put a twin sized mattress on top. It’s perfect! We’ve had this set up since they were 2 & 4, and it still works wonderfully. Hi Cathleen – thanks for stopping by! I’m actually expecting Baby #3 and still in this same house(!) so we’ve done quite a bit of updating lately. I’m planning to write up a totally new blog post update soon. 🙂 In the updates, we actually DID turn our KURA bed into a bunk bed of sorts! We put a toddler bed underneath and my now 3 yr old sleep underneath while by 5.5 yr old is in the top part. This way we can fit a crib in the room too. It works for us! Anyway, great minds think alike 🙂 and I can’t wait to get my new updated post up soon, too!